"Few things feel as wonderful as a manicure and pedicure. Well maintained nails and soft, healthy skin are essential to your appearance. Our specialists perform various nail services as well as special treatments to maintain the beauty of your nails." This supreme hand experience includes a warm hand soak, an invigorating exfoliation on hands and forearms and a hot steam towel treatment. It also features extended nail shaping, cuticle care, buffing and a warm cream hand massage. Top it off with long-lasting polish of your choice. Buffing to a natural gloss is available if you do not desire polish. 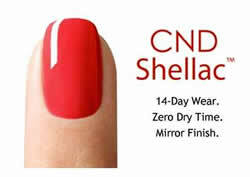 Polished Outlook offers Shellac Manicure by CND. Shellac is designed as a system, it begins with a CND Shellac Base coat followed by Shellac Color Coat and Top Coat which provides durable final coat and and seals the deal with a mirror like finish. The CND UV Lamp is used to cure the layers immediately and create the scratch resistant, high-shine finish that Shellac is known for. The dry time is zero - yes, that's right, zero! There's also no odor and no damage to nails. Shellac polish lasts for 14+ days, with durable shine that resists chips, scratches and smudges. An Ultra Hydrating Ritual! 60 minutes of luxurious attention begins with a warm hand soak, extended nail shaping, removal of excess cuticle with Alpha Hydroxy Creme and buffing. Next, your skin is smoothed and its moisture replenished during a rich mineral exfoliation, followed by a relaxing hand and arm massage and hot steam towel treatment. An incredibly hydrating paraffin spa treatment seals in hydration as it plumps and transforms your skin for a soft, cashmere feel. Finally, choose your favorite nail color and experience younger looking hands! A man's manicure, with attention to the distinct needs of men's hands. Includes nail buffing. The condition of our hands makes a statement, and no one wants the statement to be: "I'm old! (And I don't take care of my skin)". Which is why this anti-aging manicure is a winning remedy. This treatment includes a moisturizing hand soak, exfoliating scrub, nail & cuticle grooming, followed by a warm Collagen masque that softens and smoothes dry and dehydrated skin & nails. Warm Mittens are used for maximum results and relaxation. This treatment is finished off with a moisturizing massage and your choice of color.